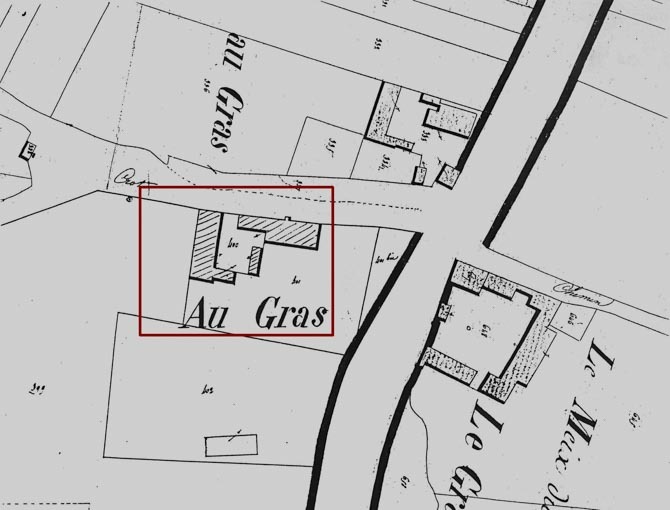 The history of the Gras estate in Saint-Loup-de-Varennes is difficult to establish. The property is mentionned on the land register of 1775 and kept by the village town hall. 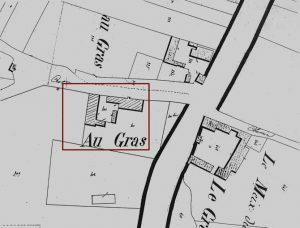 The history of the Gras estate in Saint-Loup-de-Varennes is difficult to establish. The property is mentioned on the land register of 1775 and kept by the village town hall. Beside the barn and the stable, there were other parts: one quoted as the master house, the other as a cellar. “Since this house exists, it has belonged to different persons. 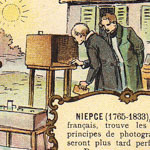 The Niépce family bought it from a M. Rocault. After Claude and Nicephore Niépce’s demise, the heirs were obliged to sell the fields, the meadows, the vineyards, the farms, the inn etc., which constituted the estate, and also many other properties located within the boundaries of different villages, to pay the debts incured to meet Claude Niépce’s huge expenses for his machines, his engines, the Pyreolophore, Hydraulic pumps and other mechanical inventions. The Gras mansion, as well as the courtyards, gardens, ground and buildings attached to it, were bought by a M. Briveaux from Chalon. Seen from the street, in fact the main highway from Chalon to Lyon, leading to the railway, the rear of this dwelling present a uniform aspect. But the facade on the gardens is quite different. 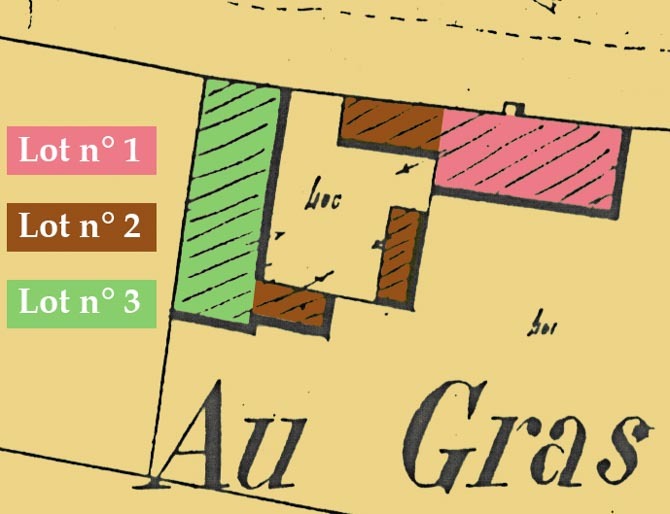 The part that was the Niépce brothers’ dwelling, and which is the closest one to the main highway, is higher and bigger than the other part that faces the old courtyard, and in which were the aviary and the other building. 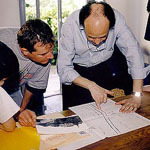 Enlargement of the cadastre and map of the three units. M. Briveaux, after he had bought the estate, divided it into three units. The first one included the living quarter, and some gardens bordering the main road; first sold to Miss Roy, sister of M. Roy-Combes, merchant in Chalon, was finally purchased by the present owner: M. Besson, son-in-law of M. Thiebaut, of the trading copany Thiebaut and Brinet, in Chalon. The other building, not as important as the preceding one, was the second unit, which included the courtyard, the aviary, a part of the garden, etc. After living here and using it for many years, Briveaux sold it to M. Bon, a grocer in Chalon. A wall and annexes were built to separate the two estates. This wall and the annexes hide for a large part the view from M. Bon’s house, giving it a rather unpleasant look; the weeds growing uncontrolled in the courtyard, and the permanently closed shutters give it the aspect of an abandoned house. The gardens of the two properties are separated by a wooden fence. The third unit was including agricultural buildings, such as barn, stable, kennel etc., as well a field fenced by the railway hedge. This unit was bought from M. Briveaux by the present owner, M. Paillot-Dupuis. M. Paillot has adapted a part of these buildings, bordering the railway street, to be his dwelling. M. Bon has kept the old big and small doors, giving access to his house. But M. Besson had a beautiful wrought iron railing and gate installed, to enter his coutyard or rather in his gardens, which were laid out and kept with a lot of taste and care, and to which he adds new improvements every day. It is from the attic window of M. Besson’s house, on the main road side, and facing the inn, that Nicéphore made most of his tests and heliographic experiments. He very often used one of M. Bon’s windows which was facing the aviary, the bread-oven, the barn roof etc., as mentioned in his letters on the 5th of May, 28th of may and 2nd of June 1816. Except for a Beurre-blanc pear-tree, which was uprooted recently to make space for a flower-bed, and some trees from the orchard, the aviary, the bread-oven, the barn etc. — all so well described by Niépce in his letters — are still there. V. Fouque, La vérité sur l’invention de la photographie, 1867.